As per title, Styles appears broken. Unable to import locally or from cloud. Unable to import with drag and drop. Default styles are also broken and display incorrectly. Could you post an image of what they look like please? I have a feeling the display incorrectly is actually how they were designed - this was something we reported back when they first went in! Regarding the importing issue, that is something also with development - it is very finicky, at first it was fine for me, but then got into a bad state! I'll get it bumped with them. @Sean P since ios12 and latest AD update I am unable to import Styles from ANY location. Styles loaded prior to the update work fine. As you can see the Sunset and Rainbow styles icons seem weird and the applied styles are probably not what the development team intended. Glad to hear that Sean. Just a suggestion. It would be nice to see a list of currently 'logged' bugs. Users could then see whether there problem has already been logged. It would also provide a level of confidence that issues are being addressed and have not simply become lost in a list of posts. Possibly posted bugs could be linked to the bugs log report, keeping things tidy. The current threads on moving objects without transforming them is a good example. Lots of diffferent threads with users becoming increasingly frustrated feeling the issue is not being addressed. These posts could be linked back to a logged bug report confirming that it is 'queued' with devs and not simply being ignored. The problem is once we've reported an issue to development it is then in their hands to fix, so we cannot really say when they are going to fix issues. However I have bumped the Move/Transform issue with them again! it seems the software doesn't recognize the .style format when I Click the button on the menu. Doesn't work either from local and icloud. Follow below a screenshot with files unable to import to my AD iPad pro, they work fine with AD Desktop. There is any future update soon that can fix this problem? thanks. Do you only have Affinity Designer on your iPad? I think there’s currently a known problem with importing styles into AD if you don’t also have Affinity Photo installed. 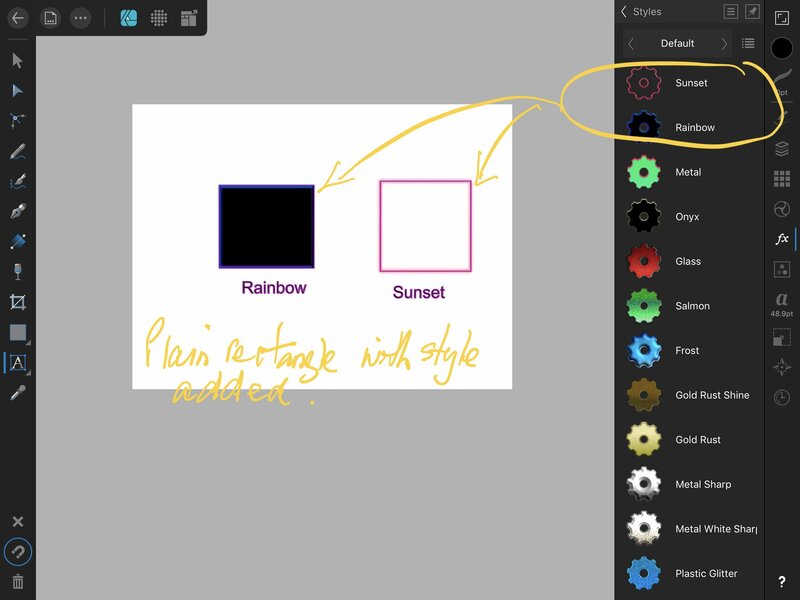 Sunset and Rainbow Styles appear correctly in in the Styles default menu view (1.6.11.85), however the default list has been reduced considerably leaving only 6 default styles.